Israeli soldiers attacked, Thursday, dozens of nonviolent Palestinian protesters, near the central West Bank city of Ramallah, and shot a government minister with a rubber-coated steel bullet in his ear, in addition to wounding four other Palestinians. 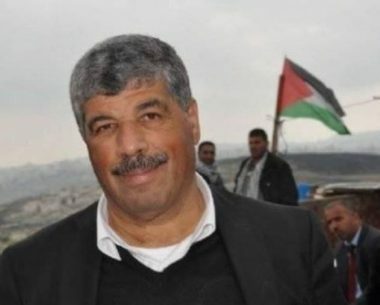 The Palestinian Red Crescent Society (PRCS) said the soldiers shot Minister Walid Assaf, the head of the National Commission against the Annexation Wall and Colonies, with a rubber-coated steel bullet in his ear. The PRCS added that the soldiers also assaulted many Palestinians, wounding four of them, during a nonviolent procession against an Israeli military order illegally confiscating private-owned lands in Ras Karkar village, northwest of Ramallah. They were also protesting the illegal bulldozing and uprooting of the lands when the soldiers resorted to the excessive use of force. Two of the wounded Palestinians were rushed to hospitals in Ramallah for further treatment.